The editor pleads guilty to concentrating too much on small layouts. The end of the line of the Hinton Saga featured a neat layout for a small space. Editor revamps an older layout to improve operating potential and create a new setting. 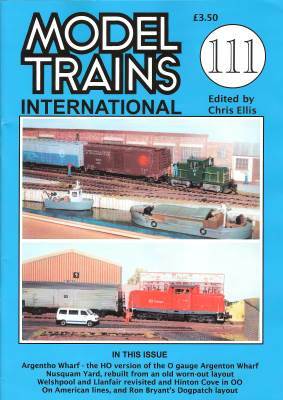 Useful tips on American modelling, backed up with a plan and comments on Ron Bryant's final layout, the Dogpatch RR. Giles Barnabe looks at this multi-purpose narrow gauge line which offers plenty of good layout ideas. Editor builds an HO version of the compact O gauge Argenton Wharf built last year by Les Coleman. A simple compact, easy to build and operate, layout in HO/OO. A United States/Canadian Border Great Lakes Region in N scale.